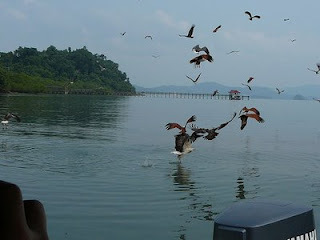 For the adventures, Langkawi offer some truly unforgettable sights andexperiences. A new tour that is bound to provide plenty of thrills to those who are game is the boat cruise to Kilim Nature Park, an escapade to another world.Spread over an area of 100sq.km, Kilim Nature Park features a beautiful mix of well-protected green mangrove forests, isolated white beaches and blue lagoons.On trail, along the calm winding river, you will be exposed to the wonders of the park’s marine ecosystem, flora and fauna and its natural habitats like the over hanging “bogak trees”, Brown Eagle, Tree Crabs, Iguanas and Macaques. Enjoy the scenic and spectacular views of unique limestone rock formation se merging from the floor or the mangrove swamps and the sea. These fascinating geological wonders have been variously dubbed as the Temple of Borobodur, the Elephant Stone and the Hanging Gardens.Explore Gua Cerita(Cave of Legends) and Gua Kelawar (Bat Cave) stepped in fabled tales of mysteries and romance.You also can explore and get experience of charcoal making at CharcoalFactory, going throught Fish Farm and many more of enjoyable journeys. These are indeed many memories during 3hours of your journey for you to bring back when your journey ends. Admire a magnificent Langkawi sunset aboard our yachts . We're at "sunset point" all year round. Watch as the tropical sun dips below the western horizon of the Andaman Sea and splashes the skies with magnificent deep oranges and reds. Or relax in our salt water Jacuzzi, with cocktail in hand. As our yatch steers along the shorelines of Langkawi, you’ll love the breathtaking islands with hideaway coves lush forests, limestone caves and private beaches. Enjoy topnotch service all the way with our English-speaking crew.Feast on our exclusive gourmet BBQ buffet, served and presented with style, complemented with a free flow of beers, wines, cocktails and soft driks. 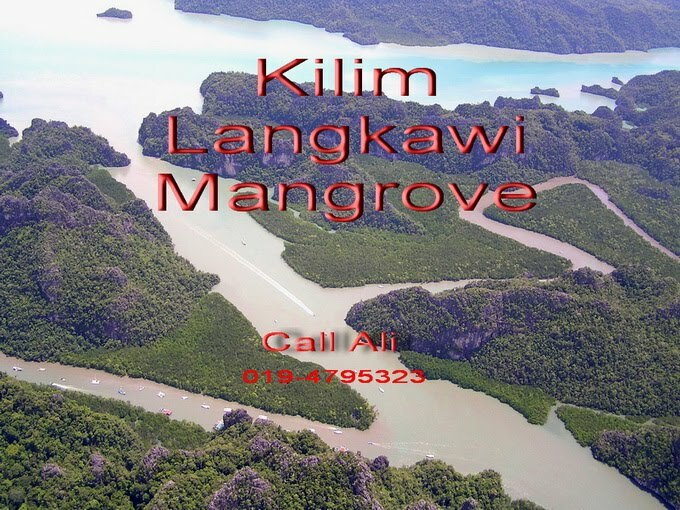 There are several mangove tour destinations in Langkawi. One of the most popular is the Sungai Kilim Mangove with its purpose-built jetty, foodstalls, convenient wooden walkways and a host of wildlife attractions to keep you gawking as much as the eagles are doing likewise to you. You can drive or be driven to this place within minutes from Kuah town. Or you can take a 90-minute coast-hugging boat ride from that urban centre.. The Gua Kelawar (Bat Cave) is also located here. You can take the wooden walkway for a 10 minutes walk before reaching the cave entrance. Gua Kelawar comprises two cave systems - the smaller western chamber that extends northeast by southwest, has a floor area of approximately 270 square metres and low roof of between one to three metres head clearance. On the walls and roof of the cave you can see embedded very old seashells. This provides proof that the area was originally the sandy bottom of an ancient river that has been shoved upwards by powerful tectonic force millions of years ago. Another reason is that the sea level about 5,000 years ago was two metres higher than today.